Mac Otakara claims the two new models will come with a USB-C to Lightning cable and an 18 Watt USB-C power adapter, with an ability for the rear of the phone to wirelessly charge Qi-compatible devices like Apple Watch and AirPods 2 "likely." 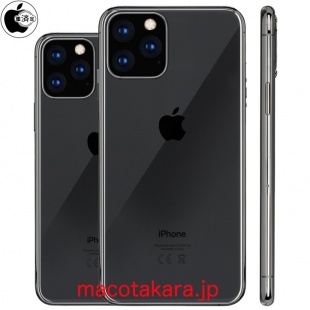 In general, the rumor mill narrative suggests triple lens camera systems are a given this year, but most other leaks – from OnLeaks in particular – have implied that the three-lens camera won't be exclusive to any one iPhone, and certainly don't suggest it will be a unique feature of additional models in Apple's lineup. Given the leftfield claims, today's report should be taken with a grain of salt, although Mac Otakara has provided accurate information on unreleased iPhones in the past, so it's possible there's something to it. Wonder if Apple will switch to aluminum back, given their failure with the chargining mat. Not if you charge your phone overnight, then it doesn’t really matter how long it takes. I don’t understand why so many people don’t charge their phones overnight, I mean it’s just laying there while you sleep, why not have it charging? I just want a ~5" all screen phone, all I see are devices and rumours for ~6" and up phones. As Edmund Blackadder would say: this is as about as subtle as a rhinoceros horn up the backside. That's my point, the whole song and dance with going to all glass was for wireless charging. Now that they failed in that department, shouldn't they switch back to aluminum back? Much more durable and my gosh, so much lighter! The phones charge just fine wireless, no failure there. What they failed at was to produce their own Apple branded charging mat. Are you saying they should disallow wireless charging after already offering it? That's if I read the article correctly. Apple seem to have the same Pre-Jobs problem. Can’t figure out who to market to, so make tons of products and hope they sell. There’s a significant cost to keep production going, inventory stocked, support services, etc for all these lines. Having 7 or so active phones with multiple colors / configurations of each means you may get more customers, but the costs to get them are much, much higher so your pricing is up there too. That mock up with the camera set up on the back looks way to obtrusive. I mean, I gather we don’t really look at the back of our iPhones, and most use cases, but that design element looks oddly off-putting. Hopefully the final product doesn’t look exactly like that.